On your first visit, you’ll be greeted and given some paperwork to fill out. Next, you’ll talk with Dr. Ho to discuss your health goals, and he’ll perform a thorough physical examination. We’ll also schedule you for a follow-up visit. Please remember to bring any insurance cards with you to your appointment. 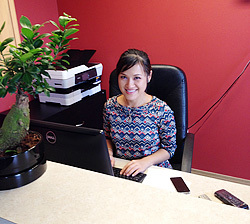 When you come in for your next visit, Dr. Ho will review the results of your examination with you. He’ll discuss his findings and care recommendations, and if you choose to proceed, you’ll receive your first chiropractic adjustment. We should have you in and out within 30 minutes. Your routine visits will begin with checking in, followed by continuing where your last visit left off, which includes education, adjustment, as well as exercises that Dr. Ho will guide you through. The entire process ranges between 10-15 minutes. Dr. Ho believes that recovery can be sustained after the completion of treatment if patients are given the tools needed. Thus, he will not only help you ease your pain but also provide you with the resources to remain pain-free. Your chiropractic care is always your choice. Many of our patients receive wellness care, which means they come in occasionally for safety check-ups to make sure their bodies function at their highest potential. We love seeing our patients continuing to live at their optimum health level even after their pain is gone, and we hope to keep seeing you!